LAWRENCE - Kansas football coach David Beaty is thankful that his program won the recruiting battle for Octavius Matthews, who will never play a down for the Jayhawks. Matthews, Rivals’ No. 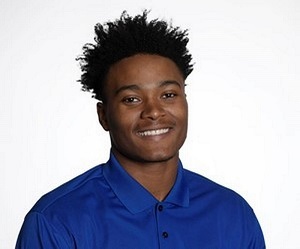 1-rated junior-college running back, has retired from football because of a rare heart condition, Beaty confirmed at his press conference Tuesday. And Beaty isn’t sure this would have been caught at many other schools. The coach says KU football has rigorous heart testing before athletes begin their careers, a process that includes multiple heart tests and also consultation with a cardiologist. Through this screening, Matthews was diagnosed with hypertrophic cardiomyopathy, a rare condition that involves heart muscle being abnormally thick. After a discussion with the sports management staff and his coach, Matthews decided to retire from football to avoid the potential dangers that could come from playing. There were other factors as well. Matthews’ mother, Kristy Bradford, died in May from heart issues while waiting on a transplant. Matthews, who originally committed to Auburn before choosing KU over Tennessee and Purdue, will remain involved with the team this season. “He’s part of our family,” Beaty said.